Please note that any diamond knife orders will be processed as separate orders in house. Other pre-set options are available upon request. Blade with various adjustable pre-set handle steps. Blade measures 1.0mm in width and each knife has a wide footplate design. Handle is 100% titanium and has a straight holder. Clear cornea blade with adjustable steps - 0.5mm, 0.55mm, 0.6mm, and full extension. Lancet blade with three preset adjustable steps - 0.5mm, 0.55mm, and 0.6mm. 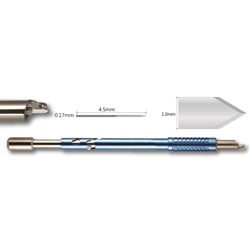 Lancet blade with two pre-set adjustable steps - 0.3mm and 0.6mm.